♪ It's never been easier to get high-quality sound for your voice and audio recordings. ♪ At home, the office or anywhere - the FIXKIT BM-800 professional condenser microphone is perfect for seasoned pros or newbie musicians who want a quality condenser microphone. ♪ Adopt a good cardioids polar pickup pattern, high output, low self-noise and the accurate reproduction of even the most subtle sound. ♪ What's more, we provide a more complete and professional equipment, you don't have to buy the other accessories anymore. ♪ An amazing singing partner, just for showing your perfect voice. ♫ Distinctive cardioid polar pattern, ideal for broadcasting, home studio recording, field recording, etc. 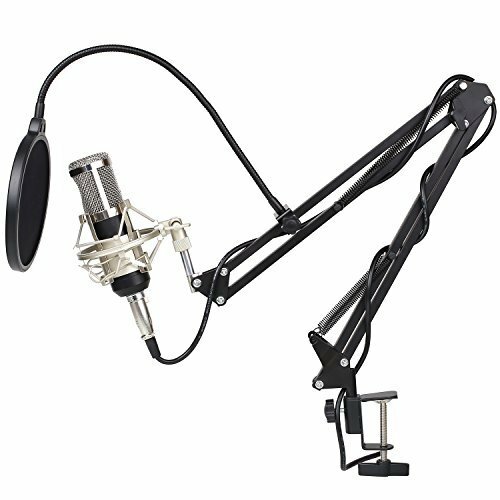 ♫ PRO RECORDING STUDIO EQUIPMENT: Equipped with Zingyou BM-800 microphone, Shock mount, Pop filter, Mic adjustable suspension scissor arm stand, Anti-wind foam Cap, Power cable, Sound card. ♫ DURABLE & STURDY SCISSOR ARM STAND: the suspension scissor arm stand is made of durable steel material. It can be sturdily mounted on the announcers' table with the table mounting clamp. ♫ PROTECTIVE POP FILTER: the double nylon net microphone wind screen pop filter helps you against plosion and popping to get your best vocal recordings. 360 degree flexible gooseneck provides adjustment of any angle or position as you want. ♫ ANTI VIBRATION SHOCK MOUNT: the shock mount is made of solid material and reduce the trill caused by vibration effectively. ♫ APPLICATION: With cardiod (undirectional) pickup pattern suppress feedback and low self-noise, it suits for studios, recording studios, broadcasting stations, adage performance and computers. If you have any questions about this product by Fixkit, contact us by completing and submitting the form below. If you are looking for a specif part number, please include it with your message.